The last part of the Affordable Winter Handbag Series is here! 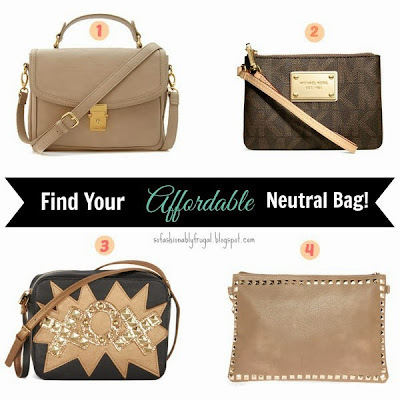 Today is all about neutral bags. Neutral colors are great for handbags because they go with almost everything in your closet. No need to worry about if your handbag doesn't work with your outfit. The chances of that happening with a neutral bag is pretty unlikely! But sorry Michael, the Betsey Johnson bag is one of my favorites out right now. It's chic and fierce... two things that are hard to mix! Plus, it's out of the box. Which I definitely am. I will wear something crazy over something boring any day. Especially with my accessories! Have a happy holiday everyone! Safe travels if you're headed out!